Sikhism (/ˈsiːkɨzəm/ or /ˈsɪkɨzəm/; Punjabi: ਸਿੱਖੀ, sikkhī, IPA: [ˈsɪkːʰiː];Hindi: सिखी) is a monotheistic religion founded during the 15th century in the Punjab region of the Indian subcontinent, by Guru Nanak, which continued to develop through the ten successive Sikh gurus, the eleventh and last guru being the holy scripture Guru Granth Sahib, a collection of the Sikh Gurus' writings. It is the fifth-largest organized religion in the world, with approximately 30 million adherents. The mouth is not satisfied by speaking, and the ears are not satisfied by hearing. The eyes are not satisfied by seeing-each organ seeks out one sensory quality. The hunger of the hungry is not appeased; by mere words, hunger is not relieved. O Nanak, hunger is relieved only when one utters the Glorious Praises of the Praiseworthy Lord. Dr. H. R. Gupta, in "Guru Nanak Dev ji (1469 - 1539)"
Sikhism for instance, though it emerged as a separate religion from Hinduism, was approved of by Vivekananda. He admired the Sikhs for rising up against Islamic power and religion in India. His description of Guru Gobind Singh, the last Guru of the Sikhs, as a ‘creative genius’ centered around the latter’s religio-political exploits against the Mughal Empire. To wean the followers away from Hindu system of incantations, Sikhism advised them to use 'Waheguru' as the only incantation. 'Waheguru' is the only incantation repeating which one sheds one’s ego. Sikhism does not subscribe to the theory of incarnation or to the concept of prophet hood. But it has the pivotal concept of Guru. He is not the incarnation of God, not even a prophet. He is an illuminated soul – a [spiritual]] torch with the jyoti (light) that illuminates the path to the Lord. God is timeless, formless, beyond life and death. The Guru, though human in form is godly in spirit and is thus a spiritual preceptor of humanity. Sikhism has expressed itself clearly and forcefully against the use of all intoxicants. It is laid down the Code of Conduct for Sikhs that: Sikhs should not partake of alcohol, tobacco, drugs and other intoxicants. Over 90 percent of the worlds Sikhs live in India; of those, a large majority are concentrated in the northern Indian state of Punjab. Canada, the United Kingdom, and the United States host growing Sikh minorities of several hundred thousand people each. In several isolated incidents after 9/11, turban-wearing Sikh men in Britain and the United States were mistaken for Muslims and attacked. The ten Sikh Gurus - Sikhism is primarily a Punjabi tradition that originated and developed under the leadership of the ten human gurus.LIke most Indic traditions, such as Hinduism, Buddhism, and Jainism, the Sikh tradition is a guru-sikh (teacher –disciple)-oriented movement in which the relationship between a guru and his/her disciple is considered sacred. The process of evolution and development of the Adi Granth is closely linked with the emergence and maturity of the Sikh tradition. The name Adi Granth provides deep insight into the central teachings of Sikhism....The followers of Sikh tradition are popularly known as Sikhs. What is Sikhism? The term Sikhism has two components: “Sikh” and “ism”. The word sikh is the Punjabi form of the Sanskrit word w:Guru-shishya traditionShishya, which means a “Student”, a learner, or a disciple, while “ism” is a Greek suffix that was added to the word “Sikh” around 1830 by the British administrators who ruled India to denote the Sikh tradition. Sikhism is primarily a Punjabi tradition that originated and developed under the leadership of the ten human gurus.LIke most Indic traditions, such as Hinduism, Buddhism, and Jainism, the Sikh tradition is a guru-sikh (teacher –disciple)-oriented movement in which the relationship between a guru and his/her disciple is considered sacred. Guru Nanak intensely believed in the Oneness of God. His search for truth resulted in a divine calling at Sultanpur where he made his historic declaration. “There is no Hindu and there is no Muslim”...he shared his understanding of divine truth with people who became his disciples who came to be known as Nanak-panthis (literally, followers of Nanak’s path or teachings) which became popular among the Punjabis. The Sikh movement has passed through many stages. 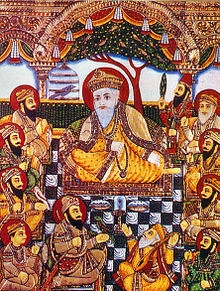 In the first phase (1469-1606) Guru Nanak and his four successors established some of the fundamental institutions of Sikh tradition, that is, the institution of human guruship, congregational worship, the langar (communal meal), compilation of the Adi Granth (Sikh scripture) and the Golden temple. The second phase (1606 -1675) began with the martyrdom of the fifth Guru, Arjun Dev. He was succeeded by his son, Hargobind who adopted a rdical policy of miri-piri (temporal and spiritual authority) for the defense of the Sikh community...During his ministry, we came across the use of the corporate title of “Sikh” for the Gurus followers. The martyrdom of the ninth Guru, Teg Bahadur is the third phase. His successor Guru Gobind Singh who founded a radical institution called the Khalsa in 1699. He introduced some fundamental innovations: a) institution of the panj pyarey (the five beloved ones); b) new-style initiation of amrit (water of immortality; and c) introduction of the title Singh for men and Kaur for women. 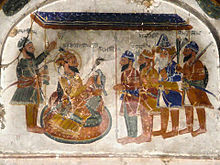 The distinction between amritdhari (initiated) and non-amritdhari Sikhs occurred after the founding of the Khalsa in 1699. In Sikhism, the diversity of God’s kingdom is perceived as a dynamic and positive force. ...Sikhism rejects the view that any particular religious tradition has a monopoly regarding “Absolute Truth”. Sikhism strongly rejects the practice of converting people to other religious traditions. God is every where. He has created us all. He who realizes this is true Hindu or a Muslim….Although threre are two paths, the Hindu and the Muslim … there is only one God. In the Sikh teachings, God is conceived as being without any form or shape (Nirankar). Therefore no image or idol can represent God. The multilingual nature of Indian society made a valuable contribution toward the development of universalism in Sikhism....The central gurudwara of the Sikhs is called Harmandir (Golden Temple). According to Sikh teachings, all human beings evolved and developed their own modes of worship and religious traditions within the context of their social milieu. Without the Naam, the Name of the Lord, no one finds shelter in the Court of the Lord, the false come and go in reincarnation. Oh! Lord of the Universe, What is Your Name, and what is it like? If you summon me into the Mansion of Your Presence, I will ask you how can I become one with You. He alone is a Brahmin who takes his cleansing bath in the spiritual wisdom of God, and whose leafy-offerings in worship are the Glorious Praises of the Lord. The One Name, the One Lord, and His One Light pervade the three Worlds. The word of the Shabad abides within, and doubt is ended, for those who constantly serve, day and night. O mind, you are so full of pride; loaded with pride you will depart from this world. Maya has fascinated you over and over, and lured you into reincarnation. You shall depart clinging to your pride, O foolish mind. In the end, you shall regret and repent. You are afflicted with the diseases of ego and desire, and you are wasting your life in vain. The self-willed manmukh does not remember God. Thus he shall regret and repent hereafter. Nanak says: O mind, you are full of pride; loaded with pride, you will depart. O mind, don't be so proud of yourself, as if you know it all; A Gurmukh is humble and modest. Ignorance and ego is within the mind; through the True Word of the Shabad, this filth is washed away. Be humble and surrender to the true Guru; do not attach your identity to your ego. The world is consumed by ego and arrogance; realize it, lest you will lose your own self as well. Make yourself follow the sweet will of the true Guru and remain attached to His Sweet Will. Nanak says: renounce your ego and self-conceit; obtain peace and let your mind abide in humility. Blessed was the time when I met the true Guru and God came into my consciousness. I became very blissful because my mind and body found natural peace. Renounce sexual desire, anger, falsehood and slander; forsake maya and eliminate egotistical pride. Renounce lust and promiscuity, and give up emotionnal attachment. Only then shall you obtain the Immaculate Lord amidst the darkness of the world. Renounce selfishness, conceit and arrogant pride, and your love for your children and spouse. Abandon your thirsty hopes and desires, and embrace love for the Lord. O Nanak, the true one shall come to dwell in your [mind]]. Through the True Word of Shabad, you shall be absorbed in the Name of Lord. Acting in egotism, selfishness and conceit, the foolish, ignorant, faithless cynic wastes his life. He dies in agony, like one dying of thirst; O Nanak, this is because of the deeds he has done. I am a sacrifice to the True Name. Your rule shall never end. Your rule is eternal and unchanging; it shall never come to an end. He alone becomes Your servant, who contemplates You in peaceful ease. Enemies and pain shall never touch him, and sin shall never come close to him. I am forever a sacrifice to the One Lord, and Your Name. This page was last edited on 17 September 2018, at 19:12.